Applications are invited from all interested and qualified candidates for admission into Delta State Polytechnic Ogwashi Uku Hnd Form Programme for the 2017/2018 Academic Session. A National Diploma (ND) obtained with a minimum of Lower Credit in the relevant disciplines from institutions where the programmes are duly accredited by National Board for Technical Education (NBTE) with a minimum of one (I) year Industrial Training in the field of specialization. Candidates who obtained ND at Pass level with a minimum of two (2) years Industrial Training in the field of specialization. At least five (5) credit passes in SSCE (WAEC and NECO), GCE ‘O’ Level, NABTEB or its equivalent in relevant subjects including Mathematics and English Language in not more than two sittings. 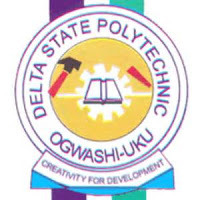 log on to https://dspg.waeup.org the website of delta state polytechnic ogwashi-uku, and click on Application for Admission, then click on HND Application form. fill the requested information and submit to obtain your application ID. Ø Five (5) copies of recent Passport Photograph. Ø Two (2) copies of correctly completed Online Application Form. Ø Photocopy of Receipt of Acceptance of HND Admission. Ø Photocopy of Examination Results (SSCE and ND or their equivalents) listed on the Application Form. Ø Letter of Completion of a minimum of one (I) year Industrial training. Ø Photocopy of Certificate of Local Government Area of Origin. Ø Photocopy of Birth Certificate or Declaration of Age.